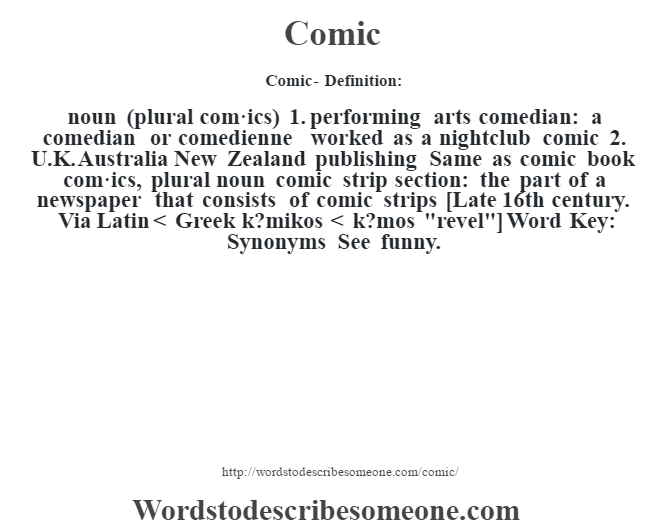 noun (plural com·ics) 1. performing arts comedian: a comedian or comedienne worked as a nightclub comic 2. U.K. Australia New Zealand publishing Same as comic book com·ics, plural noun comic strip section: the part of a newspaper that consists of comic strips [Late 16th century. Via Latin < Greek k?mikos < k?mos "revel"] Word Key: Synonyms See funny.